Awaken and invigorate your body and mind with this blend of yoga, Pilates and the Lotte Berk Method, as well as Chi Gong circular movements. All of the routines are designed to shift your inner and outer energy to produce balance and tone with a cardio kick. As a result, you’ll increase stamina and reduce inches for a lean, fit body. My favorite part of this workout: It’s as if you’re right there taking class with Exhale founders Fred DeVito and Elizabeth Halfpapp. They’re such skilled teachers you don’t have to look at the screen to follow along. Do the entire program all at once or each of the 10-minute workouts separately. Workouts are for the enthusiast and fanatic level of fitness, though newcomers and novices can probably do the first routine without too much trouble. You’ll need a mat and some yoga blocks. Energy Flow. A gentle, flowing warm-up expertly led by Halfpapp. Stretch and feel the energy flow through your body. 10 minutes. Sun Salutation Part 1. DeVito picks up the pace on this energetic yet flowing sun salutation. You move quickly from one pose to the next with some Lotte Burke style moves blended in to up the sculpt quotient. 10 minutes. Sun Salutation Part 2. Halfpapp leads this spirited yoga flow full of balances, hip openers and chest stretches. The result is long, strong muscles, better posture and more fluid movement. 10 minutes. Chi Gong and Hip Opener Stretches. The circular movements of chi gong are the perfect antidote to tight hips and thighs. The movements in this routine are just what’s needed to lengthen posture and dekink a tight lower back. Some of the stretches on the floor are a unique lesson in seated balance. Taught by Halfpapp. 10 minutes. Core and Glutes. Wow! This core and glute sequence is really tough. Make it your goal to complete the core sequence on yoga blocks. (Note: If you don’t have yoga blocks you can use a couple of thick books. Now I know why I saved my college physics textbooks all these years!) Fred DeVito brings it on this extremely challenging workout. 10 minutes. Savasana and Stretches. 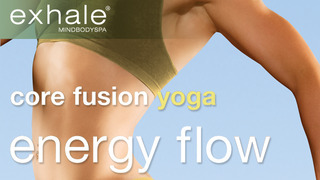 Relax and unwind with this gentle flowing stretch to calm the mind and ease the body. (Note: The Plow pose demonstrated in this routine is not advised for pregnant women, anyone with high blood pressure or asthma, or anyone at risk of stroke.) 10 minutes.